In May 1959 a notice appeared in the Gospel Herald, headed Calling All Singers. A meeting convened by John Beeken (the Pastor at Hadlow) and Geoffrey Ince (Stratford) was sufficiently encouraging for rehearsals to commence on June 16th, at St Mary Woolnoth, in the City of London. …drawn from all shades of the denomination, many travelling long distances to attend rehearsals and performances. The choir has given close on 20 public performances, mainly covering Easter cantatas, Annual Services of Praise, Song Services and Carols. It has served with SBM… Recording work has been done with the Baptist Radio Crusade. For all these engagements, John Beeken conducted, Geoffrey Ince played the organ and often gave a recital beforehand. For the Services of Praise a speaker was usually engaged to minister the Word of God. Sadly, by 1969 interest declined. There were financial difficulties and also a shortage of singers. The last public performance seems to have taken place in early 1970. 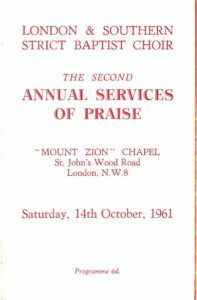 Over the ten years of its existence, the choir brought pleasure to very many people in London and throughout the south-east. Members of the choir benefited musically from their experiences and teaching, benefits which could be passed on to enhance the singing in the churches of which they were still a part.